JIVE is a 2 year project funded by the European Commission and establishes a partnership of 8 non-government organizations (NGO’s) from across Europe working within the CJS in order to exchange ideas and share good practice. 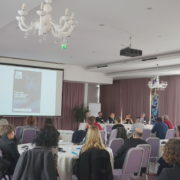 The project aims to build on the recommendations of the Policy Agenda for Europe (PAVE) and the opinion of the European Economic and Social Committee (SOC/431 – EU Policies and Volunteering) by identifying the level and nature of volunteering in the Criminal Justice Systems across Europe, reviewing current practices in recruitment, training and supporting volunteers and developing a best practice guide which can be adapted to suit various judicial systems across Europe. The primary target group for this project will be the voluntary sector organizations working in criminal justice which intend to develop their capacity to recruit, train and support volunteers. The secondary target group will be the volunteers who will receive training and offer support to offenders and their families. To design and circulate an electronic questionnaire to all known networks, organizations and national justice ministries which will capture the role and value of criminal justice volunteers within Europe. To publish a report of the findings on relevant websites, circulate to all stakeholders and hold a seminar for partners and other relevant stakeholders to present these findings. To develop a volunteer profile in terms of skills, knowledge and experience, exchange current training materials, agree essential generic components and optional components for specific areas of work. To pilot and evaluate the training course in each partner country and produce a best practice guide for organizations wishing to recruit, train and support criminal justice volunteers. Cross sector partnership work in criminal justice – Lead partner Foundation 180, The Netherlands. To undertake a review in each partner country of current arrangements for non-profit organizations working with statutory criminal justice agencies and private companies working with offenders (e.g. private prisons, community service contractors etc.). To produce a review of current practice with recommendations for the most effective models of partnership. Dissemination – Lead partner Penal Justice Reform Foundation and GRADO, Romania. To produce a regular newsletter to highlight progress of the project along with case studies and other information which will be circulated through relevant networks to highlight the value of criminal justice volunteers. GRADO will co-ordinate a final conference in Bucharest with the active participation of volunteers, ex-offenders, victims, statutory and private organizations and non-profit bodies to demonstrate the value of volunteers in the CJS. In addition, support to these workstreams will be provided by BAGazs based in Hungary and Cooperativa Sociale Cellarius based in Italy. The partnership represents a broad spectrum of judicial systems each bringing a range of experience working with volunteers within the CJS, in turn providing an opportunity to learn from each other. Several of the partners involved have direct experience of the relationship between statutory agencies, private contractors and the non-profit sector which delivers front line services for offenders, families and victims. You can read more about the partners below. Clinks is an non-profit infrastructure body which supports, represents and campaigns for voluntary sector organisations working with offenders in England & Wales. Clinks aims to ensure the sector and all those with whom they work, are informed and engaged in order to transform the lives of offenders and their families. Foundation 180 is an independent non-profit organisation established as a knowledge network which aims to improve the social position of vulnerable and at-risk youths. This is achieved by offering behavioural interventions and programs, training, consulting, audits, performance measures and data collection to organisations working with young people. 180 monitors and manages interventions for young people in the CJS. Aproximar is a non-profit organisation, established with the purpose of providing services that enable individuals, groups, organisations and communities to respond autonomously to the demands and needs of the social inclusion process. Aproximar’s focus is on services allowing for holistic and integrated interventions. RJP aims to promote improved prison conditions and constructive community sanctions. During 2000 to 2007 RJP was the Central and Eastern Europe representative of Penal Reform International, and built a regional network of experts, partner Civil Society Organisation (CSOs) and public authorities, and implemented projects in partnership with local CSOs and central government authorities in Bulgaria, Romania and Moldova. Activities involve promoting use of community service, in particular for young people, protecting prisoners with mental health issues and young people at risk of drug addiction. BAGázs aims to help those living within the Roma community in the town of Bag to realise their potential, and introduce alternatives to involvement with drugs, popularise volunteering, both through the programs in the settlement, and among the people living there, demonstrating that each individual can make a valuable contribution to their community. This is achieved through non-formal education and remedial classes to improve school performance, group and individual activities such as sports, volunteer and peer mentor training, drug prevention programmes and the dissemination of information about available support. GRADO’s objectives include contributing to the improvement of the CJS and promoting the protection of human rights and democracy. This is achieved through monitoring the enforcement of legislation during sentencing and campaingning for the rights of victims of domestic violence. Cellarius was formed in 2006 as a project of social and occupational reintegration aimed at disadvantaged individuals. Their aim is to pursue the general interest of the community, human development and social integration of citizens through employment. Specifically, Cellarius fosters and promotes social reintegration and employment of disadvantaged people with the aim of creating real opportunities for inclusion and active citizenship, by working to integrate local services. The Bremen Institute for Criminal Policy (BRIK) is a research unit at the University of Bremen. Criminologists at the Department of Law and Social Science are based here. BRIK has a very good relationship with the Senate of Justice and Constitution Bremen and has vast experience in the field of prisoner resettlement strategies, vocational and educational training, e-learning and youth justice. Ongoing projects include drafting legislation on alternatives to imprisonment and promotion of vocational training and employment for people with severe social problems.